This blog is relevant for customer’s and consultants who are implementing Employee Central on a global scale with EC instance in one central location and user base spread across globe. 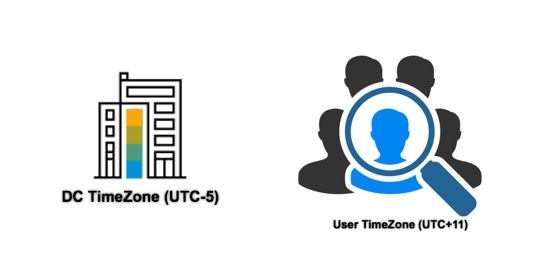 This blog talks about how the system behaves with respect to user time zone and Data Center time zone, and how to sync and get the user active when there is time lag between user timezone and DC timezone. I will be talking on what has to be done in case DC time zone is behind User’s time zone and if hiring activity happens on “As of Today” with respect to user. Use case in this blog talk about customer’s SuccessFactor EC instance is in a US data center and user of the system are across the globe. For explanation we are going to consider DC time zone is in America EST(UTC -5) and user time zone in Sydney, Australia AET (UTC +11) as depicted below. Here we have 16 hours difference between user’s business hours and Data center time, so effectively user is always one day ahead with respect to DC. Let’s take an example where “As of Today” according to user time zone is Feb 13 8AM AEST, but on DC the time is still Feb 12 4PM EST. There is an HR admin in Australia timezone where the time is Feb 13, 2018 8AM AEST already and he/she wants to hire an employee as of today on Feb 13. As his/her date is already Feb 13 they go ahead and hire’s an employee starting employment on Feb 13. 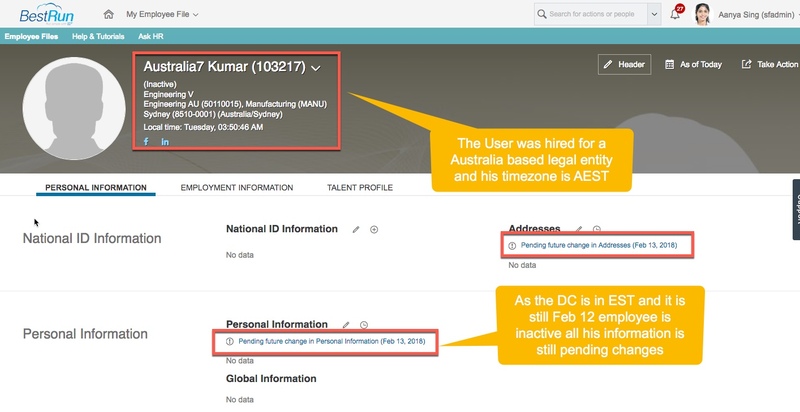 The result of above process would be that hiring process goes through fine, but the employee is not active in the system yet as time in DC is still Feb 12 EST, as shown below. To get the user active as per user time zone we need to make sure we run HRIS_Sync job with the below option checked in provisioning. When scheduling the sync job in provisioning please check option “Use the local time zone of the user to set the effective start date of the status update. Please update job scheduler if needed”. Once we run the job the user gets active and all his information are in sync and up to date as per user’s time zone. But as a best practice we recommend customer’s to run HRIS_Sync job once or couple of times a day at max. So, the customer has to choose time interval when to run schedule the job. Few point to consider are to pick a time of day when they feel most of the hiring for that data is complete. 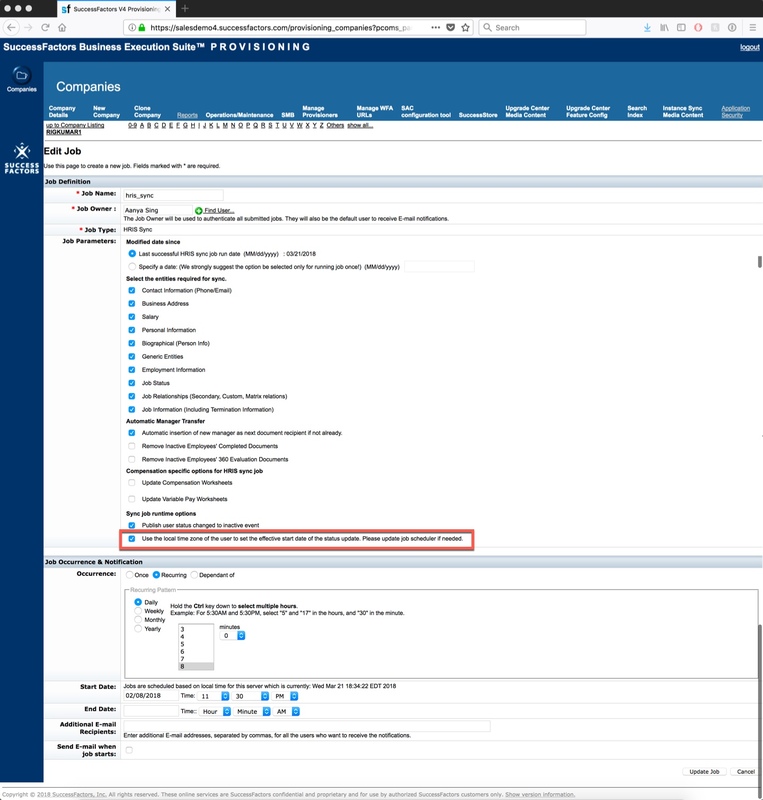 Below are some KBA articles on Time Zone explanation and HRIS Sync job scheduling. 2080728 – Employee Central: What is HRIS Sync? Nice !!! Love these small enhancements that deliver so much value!!!! This is a topic in all global projects. Thank you so much for this valuable information. Really a nice feature for our customers. Thanks for this useful article Praveen!